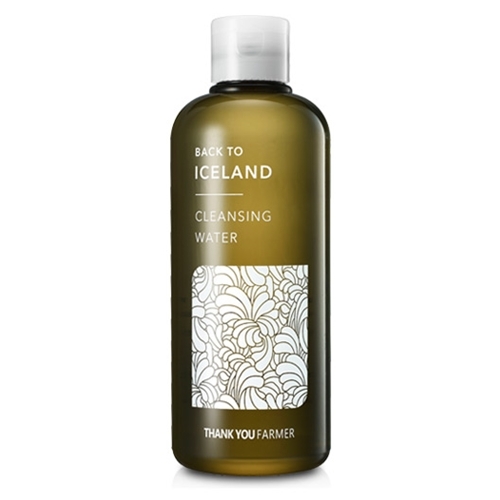 Cleansing Water with Iceland Moss Extracts clearly cleanses skin residue without tightness or dryness. • Iceland moss extract soothes skin, moisturizes, and protects skin from aging. • Long-lasting hydration of skin with soothing and moisturizing ingredients. • Refreshes, revitalizes, and protects skin after cleansing. • Antioxidant and antibacterial properties. Thank You Farmer combines time-honored farming traditions with breakthrough skincare technology to enhance your complexion’s natural radiance. Infused with natural and effective ingredients from around the globe, Thank You Farmer products are developed with conscious care so your skin grows in beauty with time. Thank You Farmer strives to make a lasting difference on the health and vitality of your skin.